Item: With Syracuse spring football just around the corner starting next month culminating with the “Football Spring Showcase” in the Dome April 22, when we were recently taking a routine look at the upcoming season’s schedule for planning purposes, we realized that all five road games will be played in southern states, with Kentucky sort of the exception, marking the second time that’s occurred in the last three seasons – no road games to be played in the northeast or mid-Atlantic states. The first road game of 2017 is in Louisiana in late September to finish off the home-and-home series with LSU. Then it’s to North Carolina to meet N.C. State, Florida twice in a three week period for games against Miami and Florida State and finally to meet Louisville in November. 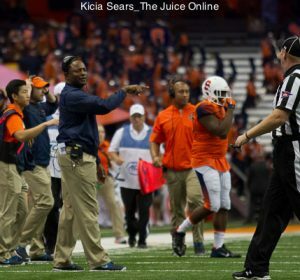 That sort of itinerary allows Dino Babers and his staff to regularly unveil the program’s style of play in one of the country’s most fertile recruiting regions. From focusing on competing for the 80 year old Lambert Trophy (now known as the Lambert-Meadowlands Trophy) as the best FBS team in the East and former Big East titles, to playing for the upcoming 13th Dr. Pepper ACC Championship in the almost 64 year old conference long entrenched in Greensboro, N.C., has marked the past five seasons of the north-to-south transition for Syracuse football. 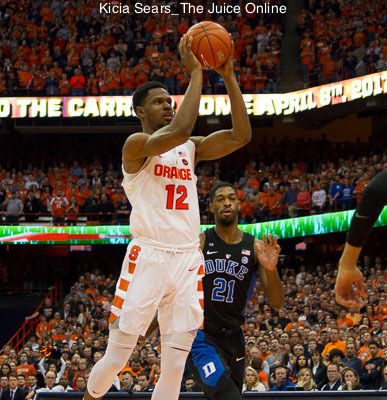 Several weeks ago ACC schools voted unanimously to no longer recognize the ACSMA (ACC Sports Media Association) All-ACC Basketball team/awards as “official” (full disclosure, The Juice is a member of ACSMA), and instead will substitute a hybrid collaboration of a coach, radio crew member and two media members who regularly cover the team as the official voting result. The reason cited for the change was to ward off what some conference schools felt was a geographical bias in the voting results concentrated by media members in North Carolina and Virginia, which by sheer numbers tilt the geography no matter what because those two states comprise roughly 70% of ACSMA membership. Newer conference schools, and even those that came in previous expansion in the 90s or early 2000s, but are still removed from that Carolina-centric core, had not seen enough evidence that their program’s were receiving equal consideration for all-conference honors. 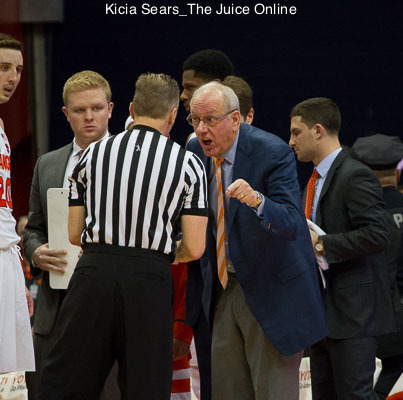 Along those lines, we can guarantee you that while the majority of the league’s southern-based media certainly knew the SU basketball program when it joined ranks in 2013 thanks to Jim Boeheim and the Dome, it didn’t have an abundance of knowledge about the nuances of the roster and coaching staff even for a program that was coming off a Final Four appearance. For football, with Scott Shafer then entering his first of three seasons, Syracuse (and Pittsburgh for that matter) was an unknown quantity to that 70% media majority residing in Virginia or North Carolina, other than the fact that minds were made up pretty quickly that the Orange had a long way to go not to be considered a pretender rather than a contender coupled in a division with Florida State and Clemson. It will be interesting for the upcoming season, already the fifth for the Orange playing ACC football, to see how the southern-flavored perception plays out as Babers enters his second season of rebuilding to get back to a bowl game.